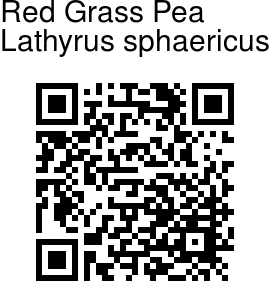 Red Grass Pea is an erect or rising annual herb. Stem is hairless, not winged. Leaves are paripinnately compound, with leaflets 2, 2-9 cm long, 1-3 mm broad, linear or lanceshaped. Stipules are 3-15 mm long, semi-arrowshaped. Flowers occur singly in leaf axils, on stalks 1-15 mm long. Sepals cup is 5-6 mm long, teeth subequal, 1.5-2 times as long as the tube. Flowers are red or orange. Standard petals narrowed into long unguis; wings on long narrow unguis; keel oblong, on long unguis. Pods are narrow-linear, 3.5-6.5 cm long, 3-5 mm wide, slightly compressed. Valves convex, with lengthwise oblique venation. Seeds are round, compressed, 2-2.5 mm diameter, brown or olive-green, smooth. 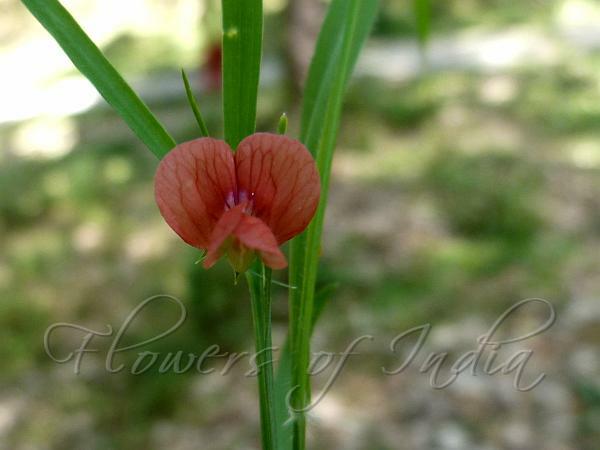 Red Grass Pea is widespread, native to Europe, Africa, W. Asia, C. Asia, Himalayas, Afghanistan to W. Nepal, at altitudes of 1300-1600 m. Flowering: February-April. Photographed in Ranikhet, Uttarakhand & Chamba, Himachal Pradesh.